So I mentioned in my first post that I wanted this blog to focus on literature, philosophy and metaphysics. I touched on the first two, but haven’t really gotten into my fascination with metaphysical studies. I’m mostly intrigued by the paranormal branch of metaphysics; about two years ago I became a member of the San Diego Paranormal Research Society, a team that investigates supposedly haunted locations. If you’ve ever watched Ghost Hunters and Ghost Adventures, that gives you an idea about what our team does, (except we really do take our investigations seriously and never fake evidence!). I’ve been studying the paranormal since I was a kid, but since I joined the team I’ve learned so much my head might burst any moment. Personally, I feel that there has to be intelligent life out there, and I think they’re already around. I don’t think I’ve seen a real, undeniable extraterrestrial craft, but throughout my studies on the matter (and I’ve studied a lot), I came to the conclusion that something has either been here, is here now or will be soon. Blame Ancient Aliens. I know, I know, a lot of the theories presented on that show are very far fetched. But if you can get past their sometimes-crazy assertions and Giorgio’s hair-creature, the Ancient Alien theory does have something to it. The argument for it probably deserves it’s own post, though. 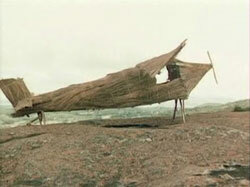 But go ahead and Google the Cargo Cult phenomenon 🙂 That’s pretty much what convinced me that something… strange was going on back in the day. Anyway, if anybody out there in internet-land wants to learn more about out our team, check it out here: http://www.sandiegoparanormalresearch.com. I love how you put the stick plane ideal here as a pic. Showing that when we see something we do not understand or grasp we think them Gods and the like. Like this pic of a plan idol, that a tribe that has never seen a real plan before tell people came there and gave them food. And so they made this stick plane to worship them. Thinking them Gods and such.